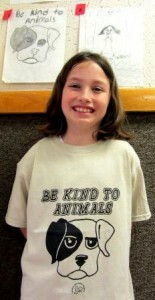 Mackenzie Myers, 9, of the Osceola Mills Elementary School, is the 6 – 9-year-old age group winner of the “Be Kind to Animals” T-shirt design contest sponsored by the Animal Welfare Council/Allegheny Spay and Neuter Clinic of Woodland. Mackenzie is wearing a T-shirt with her winning design. The contest was open to all youth who were ages 6 – 17 years; entries were received from four school districts, as well as from those who sent in drawings.